This is a project I made as part of The Silhouette Challenge facebook group. The goal of the group is to make a unique Silhouette-cut project each month & link it up. (This is my first one, so far!) :-) If you'd like to join us, simply drop Lauren a line. Her blog is The Thinking Closet & you can reach here here via email. 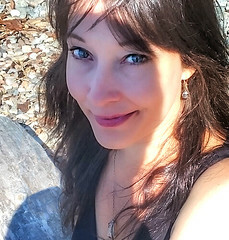 Lisa, who just created a stunning collage, that she shared on her blog, here. have been wanting to share them with you, since they're so very handy! 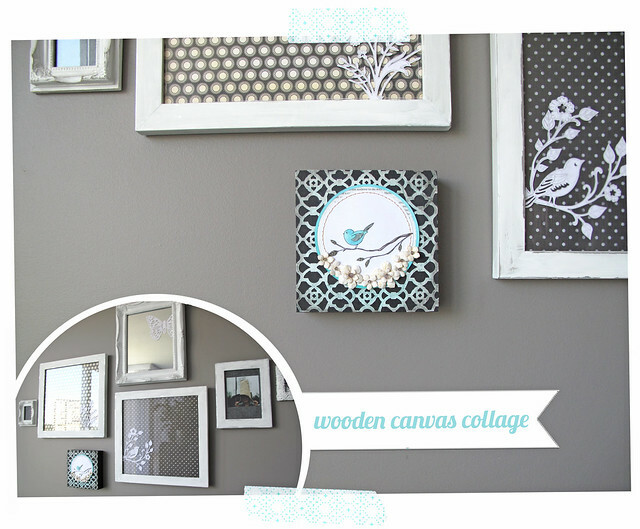 Cradled panels are surprisingly light, so they are very easy to hang. Their light weight also makes them quite affordable to ship in the mail. They're made from a renewable resource, which is very important to me. Want to know where to find them? When I was researching the best supplies to make collage art to sell, these came up all the time. Many artist's prefer them to cloth canvases, because they are less likely to rip or crack in the mail. 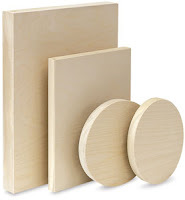 They are great for encaustic work or beeswax collage & they can stand up to many collage layers. A cut file to create a background texture with. Step 1) Make an interesting background element out of cardstock. 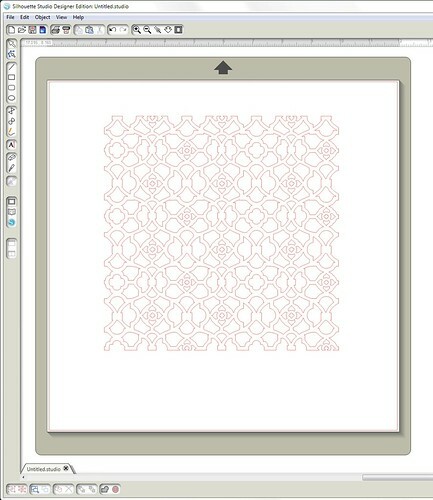 I cut a design using the Silhouette cameo... this Small Fancy Gate file from the Silhouette store. It's cut out of Neenah Solar White cardstock. 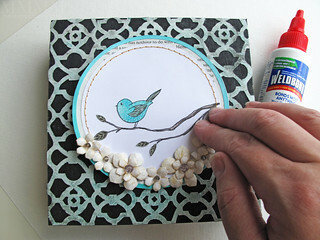 Step 2) Add texture to your cardstock, if you like. 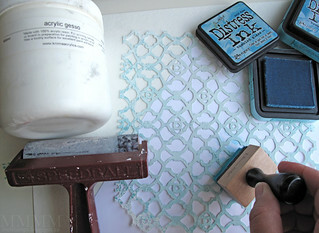 To add more interest, I applied acrylic Gesso to my Silhouette cut cardstock, using a brayer. After the gesso dried, I used a foam applicator to add colour with Distress Inks. 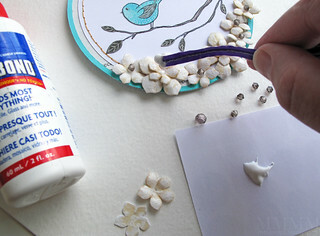 (If you don't have any Gesso, white acrylic paint would work nicely and any ink or colour medium would work as well). Step 3) Paint a cradled panel (I painted mine with black craft paint). Then adhere the cardstock to the wooden panel using acrylic matte medium. 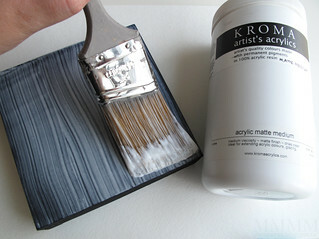 I use a local brand Kroma (from Vancouver BC) but Golden also makes it (they list some uses for it in art, here), and I have heard amazing things about Claudine Hellmuth's multi medium (matte). Step 4) Dab off any excess matte medium using a rag. (It washes out of the cloth nicely with a little warm water). 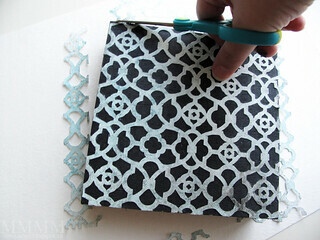 Step 5) After the matte medium dries, trim the excess paper off using scissors, or a hobby blade. Step 6) Distress the edges to soften the look, if you like. (I added a tiny bit of Black Soot Distress Paint & wiped away the extra with a damp cloth). Step 6) Add a focal image - To adhere things like this, I love Weldbond glue because it's very ecological (it's non-toxic & has the eco-logo) Plus it's also strong & cleans up with water. I added a fair amount of Weldbond and pressed on it a little here & there, to be sure it dried flat. 1) ...printed a free flower template onto heavy cardstock. 2) ... added the fabric with Mod Podge (just coated the cardstock with a layer of Mod Podge & stuck fabric on it leaving the flower template printed visible on the back). 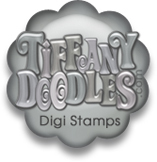 3) ...stamped on the fabric with Frost White Colorbox ink & this paisley stamp & heat embossed the ink with clear embossing powder. Distressed them, to look tea-stained, with a little Antique Linen Distress Ink & water. 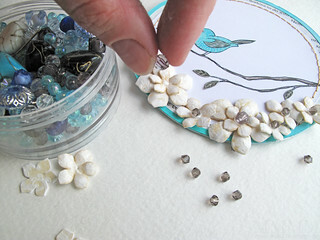 4) ... Cut the flowers out & shaped them using a stylus tool (or the pointy wooden end of a paintbrush). these projects by the Gals in the group are sure to be fun! This is so cute! 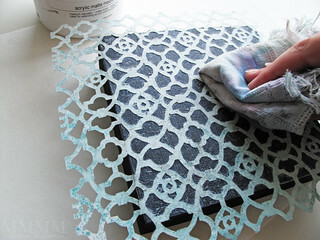 I've seen that distressing ink at the craft store and wondered what it was for. Love it! This is a BEAUTY!!! love it! This is such a beautiful project! Love the wonderful textures.. those fabric flowers are WOW! Oh. My. Goodness! This is absolutely fabulous! I can't believe you created all those details yourself. I was floored when you said you made the flowers. Wow! 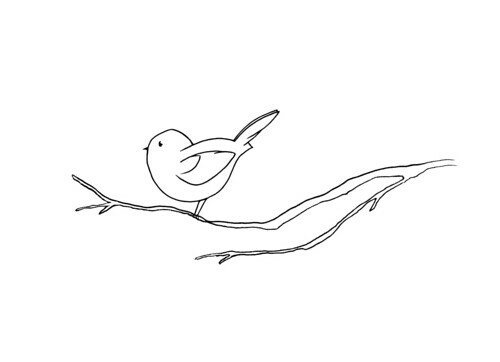 I love the little bird, the colors you chose, the background you used, etc. I love everything about it! What a very sweet little collage. I don't think you'd have any trouble selling something like that. Thanks for the detailed tutorial. 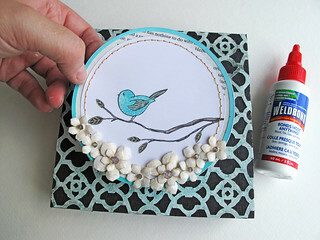 Your pictures and descriptions are just perfect for someone like me without a lot of card making experience. So glad you shared this one in the Silhouette Challenge. Have a great day! So awesome Mel! :) Hopefully I'll learn to use my Cameo as well as you! This is beautiful, Mel! 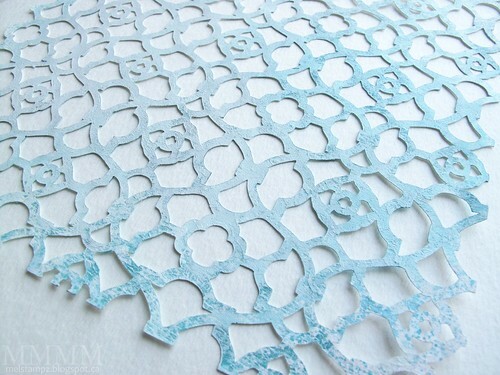 Love the cutwork you created with you Silhouette. The flowers are gorgeous! Wow, so gorgeous. I love your background. I just bought a Spellbinders with a similar bg and would have never thought to use it like that. You rock my world! I absolutely love this! 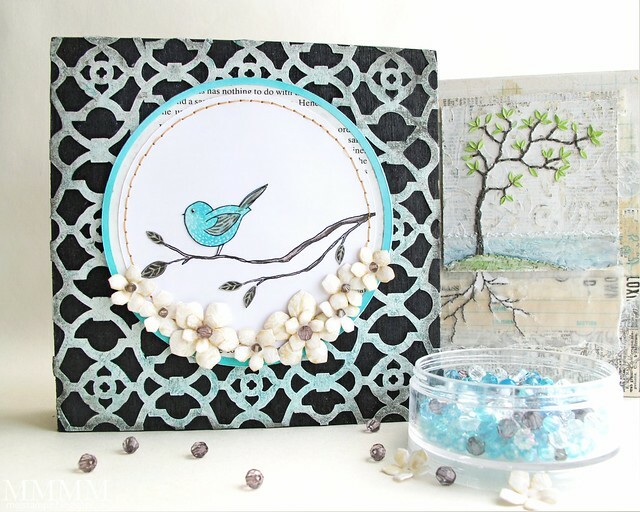 I am on a bird kick and those are my favorite colors! soo soo soo pretty! Melanie, what a treat! Thank you for this incredible tutorial. I have to say you are such a gifted teacher. You always present projects that make me think out of the box, but you don't leave your reader stranded with a big question mark over our heads. You always do such a great job of giving us the tools needed to accomplish it ourselves. Those flowers that you made are absolutely incredible. I'll never stoop to paying for flower embellishments again! ;-) Such a beautiful creation. We're so blessed to have you in our Silhouette Challenge group! Thanks for participating this round! Mel, this is beautiful....stunning!! Thanks for sharing. So pinning this one, it that okay? Great tutorial too!!! Love your blog. I can see you are having a dandy time with your Silhouette!--they are really addicting aren't they? 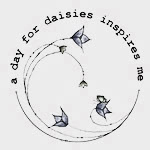 I even dream of designs LOL Your Sil group sounds like a lot of fun and your project so very cool! Absolutely GORGEOUS project. Thanks so much for sharing your creative process with us. I LOVE this! 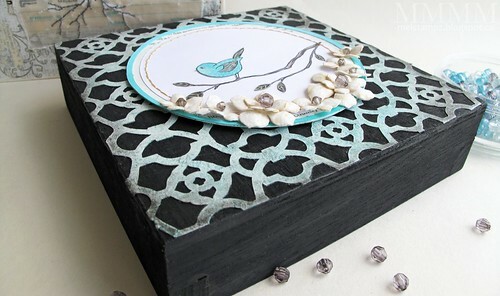 I'm so into card making & stamping lately and this is like a card but on a keepsake box! This is so beautiful! Thanks for sharing and inspiring us with your creativity. so happy to see you posting more often. A day without Mel is like a day with out sunshine! a fab project, Mel!! so cleverly YOU! oh wowie! this is hot!! this reminds me i need to buy a new blade!